Fiber Cement/HardiePlank or LP SmartSide Siding? I get asked this question often working Texas Home Exteriors, “Greg, what is better, Fiber Cement/HardiePlank Siding or LP SmartSide Siding for my Houston TX home?” As we move into 2014, I have already found myself being asked this question more and more. I respond with information based on my research, experience installing the two building products as well as discussion with other professionals. The information in this article, I am offering based on many years of experience in the Houston Texas southeast Texas metro area and as the owner of Texas Home Exteriors. In this post, I will cite information from some of the most powerful resources I know of on the internet presenting their accumulative input including Google Books (James Hardie), Wikipedia (James Hardie) and Wikipedia LP (Louisiana Pacific SmartSide) These are sites and resources that you can and SHOULD check as well to learn more and research what people just like you and me are saying around the country and world. So having said that, below I present the good, bad and the ugly so you, as a Houston Southeast Texas homeowner, can make an informed and intelligent decision. I encourage you to click on the links as well and doing some of your own research. 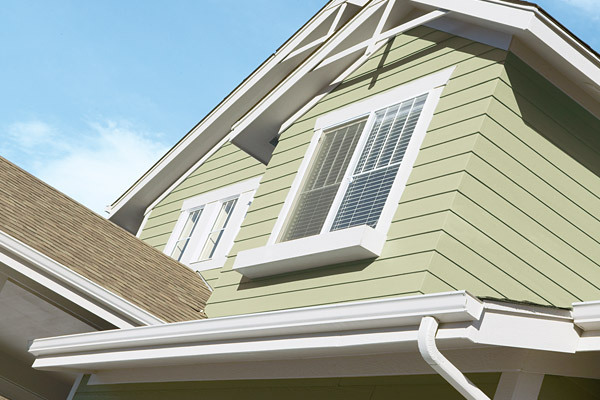 Both Fiber Cement (Hardie) and LP SmartSide Siding are outstanding and quality building products. They both exhibit excellent qualities in their performance and longevity as excellent siding product choices for your home’s exterior. Keep in mind that each has great qualities as well as some not-so-great qualities I will point out based on my many years of experience in home exteriors here in the Houston southeast Texas area in using both products, (fiber cement – LP SmartSide Siding) and research I have done on the products and their overall performance. Supporting Evidence from GOOGLE: When being asked about one siding product vs another, one might share their opinion from their experience, of course this is OK; however, I will also provide examples of what others are saying from around the country. Fiber Cement/HardiePlank- 15 Year Trim 30 Year Siding Warranty: As you can see from exploring the links above, there have been some issues reported from around the country. Fiber cement has become more and more popular since the late 1990s in re-siding as well as in new construction throughout North America. The reported issues range from cracking and flaking paint to installation problems as well as other issues with the fiber cement siding product. The siding most often used siding product in America is fiber cement. Many of the problems with this product have stemmed from the improper installation of the fiber cement product however; there are also some issues to be aware of that actually stem from fiber cement product failure itself. LP SmartSide Siding – 50 Year Trim 50 Year Siding Warranty: LP SmartSide has also been around since 1997, I have done extensive research via the internet and have not found nearly as many, or for that matter, any issues reported with this product at all, no reported problems, even LP SmartSide reports there have been no claims on product failure of the the LP SmartSide Engineered Wood Siding Products in the past 14 years it has been being installed on homes. In all fairness, I will share that there was an issue I came across in regards to Louisiana Pacific (LP) and their OLD Product, called “Inner Seal” which has since been discontinued, this was a pre-1997 SmartSide product that failed, recalled and any claims paid responsively and quickly, very impressive on the part of Louisiana Pacific. In my opinion, this product should not have been used on homes in areas of the country that receive a lot of precipitation, thus the failures. (Note, that the “Inner-Seal” siding did very well in other areas of the country that are more arid and the product continues to stand up well in those climates to this day). Louisiana Pacific SmartSide Wikipedia information at LP SmartSide: (LP) “Two years after the first suit, LP had settled all related disputes. LP re-engineered the product, now marketed as LP®SmartSide® and since 1997 has sold approximately 3 billion square feet of SmartSide siding with no warranty claims for fungal decay.” This was reported on Wikipedia in 2014 of this product that has been around since 1997. Fiber Cement (Hardie) Wikipedia information at Fiber Cement: per Wikipedia, “Fiber cement siding (or “fibre cement cladding” in the UK and Australasia) is a building material used to cover the exterior of a building in both commercial and domestic applications. Fiber cement is a composite material Fiber cement is a composite made of sand, cement and cellulose fibers. Read more about Fiber Cement by clicking on the link at the top of this article which will take you to Wiki and Build Direct FAQs. Benefits of Fiber Cement/HardiePlank Siding Products:Fiber Cement has the upper hand by far in the category of Fire Resistance so if you are looking for a siding product that specifically is more resistant to fires then Fiber Cement is the better choice. Fiber cement is one of the most resistant materials there is for your exterior. If installed properly, it is insect-proof, because it offers no food source to insects. It is fire-resistant, moisture-resistant, and is not prone to warping or cracking, thanks to the cellulose fibers which boost its dimensional stability. And manufacturers offer a variety of pre-painted colors to choose from. Disadvantages of Fiber Cement Siding Products: Fiber Cement is much heavier than other siding types and requires two or more workers to install a single plank increasing labor costs. Fiber cement siding can also be difficult to work with, as workers cut the material it creates silica dust plumes that can be harmful if breathed in. With Longer planks” 16’ foot vs 12’ allowing workers to cover more with one plank and less joints to finish. The product is 39% lighter on average, the material does not break when being carried or moved, hammer marks don’t show up easily, no special saw blades or equipment is needed (no need for $100 special blades, regular wood saw blades work just fine), no nail gun pressure issues or need to lower presser. Much less dust than the fiber cement product, silica plume issues gone (link to more info below), installation of this product helps keeps walls strait”, stronger siding provides support keeping walls straighter. Installers like working with the product more due to the reasons above. Disadvantages of LP SmartSide Siding: SmartSide siding is constructed of a wood base, leaving it vulnerable to fire from combustion or through the melting of the resin add-ons when exposed to high heat. What you have read above is from an article I wrote you can find more information on our website about home siding options and you can also learn more about silica dust and it’s affects. I hope that you have found this informative article most helpful. Aside | This entry was posted in Fire, Home Exterior, Home Improvement, Home Siding, Houston Texas, James Hardie siding, LP SmartSide Siding, Siding, Texas Home Exteriors, The Woodlands Texas, Tyvek ThermaWrap and tagged Hardie Siding, HardiePlank, Home Exterior, Home Siding, Houston, houston texas, James Hardie, James Hardie Siding, Kapitan The Siding man, Kapitan The Siding Man Blog, LP SmartSide, Siding, Siding Houston, Siding Installation, siding texas, siding tx, silica dust, Southeast Texas, Texas Home Exteriors, The Woodlands, The Woodlands Home Exteriors. Bookmark the permalink. Do you recommend a certain paint and type that will last on the Smart Siding? Or any that you have seen that you know to stay away from. Supper Paint is what we recommend. I would say the Sherwin – Williams paint (supper paint or above) and stay away from any of the builders cheap paint. This is a great article if you are considering HardiePlank vs. LP SmartSide Siding for your Houston TX metro area home exterior.